Did you know that February 22 is National Ginger Appreciation Day? Yeah, we think Wally does it better, too! 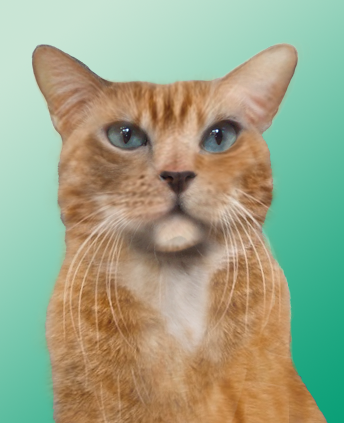 This was done using the clone stamp with a 40% blend and flow setting and a photo of a tabby cat for our source. For more Caturday Cat Art fun, check out these entries in the Blog Hop here! Lol that is great. Have a super Saturday. Seeing Faraday as a ginger tabby made my head explode a little! Faraday: After what Mommy did to me, I think I'll lobby for some too! Wow Faraday, I never would have recognised you! YOU do it better, Flynn!! Faraday as an ORANGE BOY???? ...and I thought OUR post was scary. MOL thanks but we're kinda hoping mommy backs awaaaaaay fro the cloning pen next time! We think you look good in ginger! Great idea for an upcoming art hop!! Wow....that just makes our heads spin!! A ginger kitty with blue eyes!! Just a bit too freakish, we think! MOL! Whoa, Faraday, that's some disguise! Como? Allie, is there nothing your Mom can’t do? Now I find out she’s a Photoshop wiz too! Pawsome. Allie: Oh girlfriend, this time she just WAY overstepped. Don't you think? A bit...CREEPY! Felix is all HISSED off that he missed Ginger Day! And Faraday, that is just a little bit...um...weird. Sorry. Felix, dood, tell them to take a Mulligan and get you a special Ginger Day next week! You are beautiful...we LOVE gingers! Happy Caturday from the Pawesome Cats family! *wiggles paw in hello* HI THERE!! Thanks for stopping by and commenting!!! But me too think´s that you look better as yourself and Wally the Island cat too ! oh Charlie Rascal, you and us both!! We think you look great!